The home seen below is thought to be one of the oldest homes in Marion, if not the oldest. The original four-room, one-story dwelling is thought to have been built around 1804. When it was remodeled in 1870 the second floor was added, as well as two bay windows, the double porch, and gingerbread details. This was originally the home of Thomas Godbold, Jr. whose father, Thomas Godbold, Sr., founded the town of Marion and donated the land for the town square. 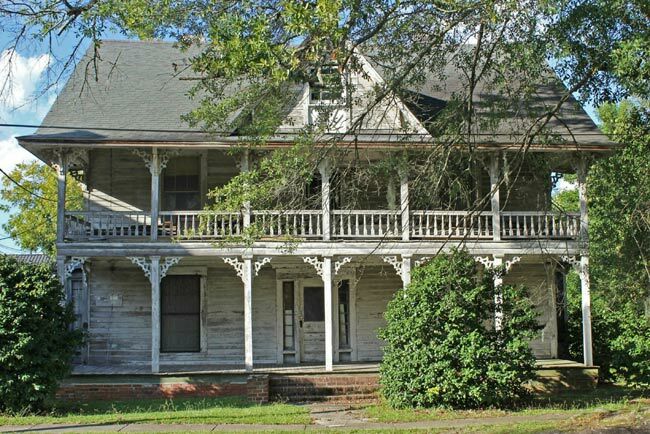 It was always a two-story house; the 1870’s remodel raised the ceilings in the upstairs front rooms, but the hall ceiling remains at the original low height as does the front pediment, which is probably the original portico of the house.